Just the other day, Disney confirmed that a Boba Fett movie is planned as the next Star Wars anthology movie (after Rogue One). The result? A whole lot of complaining. Your author falls into what might be considered the second wave of major Star Wars fans, those kids who by youth or simple lack of conception, were unable to see the Original Trilogy in the theaters. They grew up in the relative Star Wars wasteland of the late 1980s and early 1990s and had their fandom fueled by the release of the now defunct Expanded Universe and the digitally remastered editions of the Trilogy. In that group, as far as was observable, one bounty hunter had a special place above all others, Boba Fett. Fett in that time period had enjoyed a continually increasing adoration amongst fans which began more in the first wave of fans with appearances in miscellaneous media (not to mention an awesome toy) leading up to Empire Strikes Back and subsequent movie appearances. For the purposes of Fett fans following Return of the Jedi, it had appeared as if Lucas had sent his mysterious bounty hunter to the afterlife via an ignoble death by accident and Sarlacc consumption (this inglorious end did not dampen the excitement around his character, nonetheless). Yet, when the credits rolled on Jedi, it appeared to mark the end of Boba Fett. The early to mid 1990s, however, marked return for the man in Mandalorian armor. A Dark Horse comic book series Dark Empire came out on the heels of the highly successful Thrawn series by Timothy Zahn and resurrected the bounty hunter by revealing that he had survived the Sarlacc Pit. A legend was reborn. It flamed Fett’s popularity with fuel being tossed on the fire by Fett’s appearances in video games and more written media, such as Tales of the Bounty Hunters and even his own comic book series. 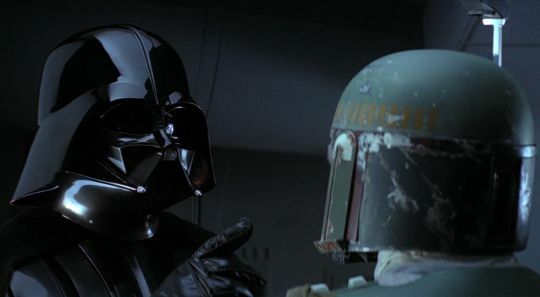 Fett’s popularity may have definitely inspired Lucas to add the deleted scene from Star Wars, when Jabba confronts Han, in the Special Edition. One definitely has the impression, as the camera lingers on Fett, who is present in the scene, that Lucas appears to be pandering to Fett’s fans. Then the Prequel Trilogies were released. Little time or space will concern the prequel films, but regardless, teasers for the second film, Attack of the Clones, revealed a very familiar figure in Mandalorian armor. As fans would quickly learn, this individual turned out to be Jango Fett, the genetic base for the clones of the Old Republic’s armies, and father of Boba Fett. The most feared and loved bounty hunter of the Star Wars universe was reduced to a ten to twelve year old boy, and a clone at that. While at first it at least appeared that Jango Fett would live up to the family name, it also appeared that Lucas simply could not hold back some form of trolling desire to tweak the noses of the Fett fandom, by killing off Fett the Elder in a remarkably easy manner by Mace Windu. 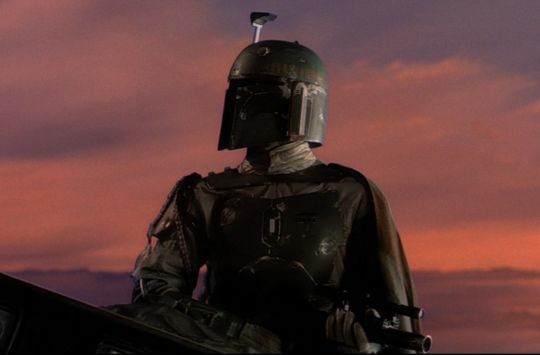 Our last scene of Boba is a silhouette of him holding his father’s helmet (and head, presumably). Since that moment, it has seemed as if Fett’s popularity has declined or at least, his critics have become more forceful. Little connected to the Prequel Trilogy has emerged unscathed (with exception to the topics rehabilitated by the Clone Wars – and that also stirs up some Mandalore issues) and in the post-Prequels world, some have questioned why Fett is special to begin with. It seems, as the Expanded Universe is no more, that any argument for the fetishization of Fett should rely upon the Original Trilogy. 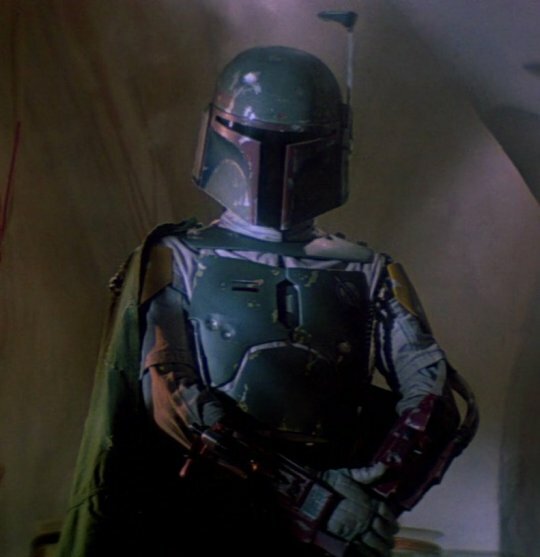 Fett first appears on screen in Empire as part of a line up of bounty hunters brought in by Darth Vader to help hunt down Luke Skywalker and friends. It’s a gallery of the weird, intimidating, and cool, from the lizard-like Bossk to the odd thin pipe looking IG-88. Then there’s Fett. His appearance is less alien and more mysterious. His helmet’s dark visors remind us of metal helms from ancient Greek battlefields and his outfit’s color combination of the red, green and yellow just work. He’s part of a rogue gallery, but specifically identified as more dangerous or reckless by Darth Vader who points a gloved finger at the bounty hunter, “No disintegrations!” Immediately, we know that Fett is one of the dangerous individuals on the bridge of the Star Destroyer hired to hunt down our heroes. While our heroes detach, float away with the refuse, and watch the Empire’s ships disappear into the starry blackness of the surrounding space, they believe the ruse was successful. It did fool our main antagonist, Darth Vader, the entirety of the Imperial fleet amassed in the hunt for them, but one figure was not tricked, Boba Fett. Fett’s understanding of Han’s trick allowed him to hang behind, note where the heroes were heading, and notify the Empire ahead of their arrival at Bespin. The ramifications of this go even larger for the purpose of the movie. If the Empire did not know the Millennium Falcon was headed to Cloud City, then Vader would never have been able to set his trap for Luke, nor would Han, Leia, and company, have been put in jeopardy, forcing Luke to abandon his training with Yoda prematurely. Fett tips the domino that sets off the chain of events that shape the second half of the film. As first time viewers, however, we are unaware of this connection until Lando Calrissian leads Han, Leia and Chewie to the conference room where Vader awaits. 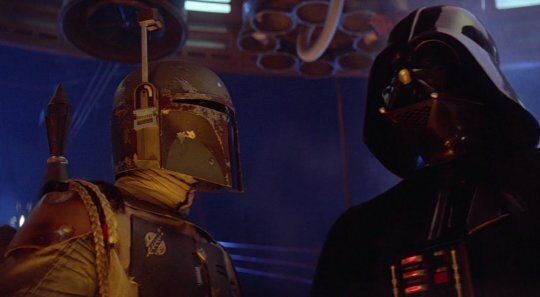 From this point until Slave I soars away from a landing platform with a carbonite frozen Han in its storage hold, Fett exudes confidence in the face of one of the most feared individuals inf the galaxy, Vader. Only one other non-hero of the film talks back to Darth Vader, it’s the caped administrator of Cloud City, Lando. Yet, when Lando complains to Vader about the changing nature of their agreement, it’s from a position of inferiority with Vader explicitly reminding Calrissian of his negotiating position (none). Fett doesn’t complain to the Sith Lord, he nearly threatens him. As Han is being positioned to be frozen, the bounty hunter growls, “He’s no good to me dead.” [Editor’s note: Greedo’s behavior in the cantina in the previous film implies that Han is wanted dead or alive.] Vader doesn’t react with a reminder that he and the Empire can walk roughshod over Fett, as he did with Lando, but instead informs Fett that he will be compensated if Han doesn’t survive the freezing process. 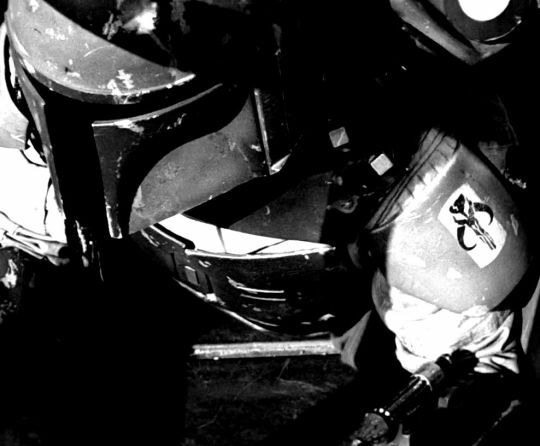 Fett is treated as an equal by the most feared villain of the film. Like a safari hunter walking ahead of the strung up prize from a day’s hunt, Fett leads the frozen Han away and out of the desperate attempts of Lando, Chewie and Leia, to rescue him. In Empire, Fett wins. He sets out with the goal to capture Han and take him to Jabba and that’s exactly what he does. No other character in the film manages to get exactly what they want, be it Luke saving his friends, Yoda training Luke to his satisfaction, or Vader convincing Luke to join him (or capture him for the Emperor). The Empire is an unstoppable force in the movie, but one bounty hunter out performs its star destroyers and unrelenting storm troopers. Empire ends on the sorrowful note of the loss of Han and it’s the plan to rescue him that brings Fett back onto the big screen. Return of the Jedi is a great film, but it also notes the first signs of the George Lucas that lead to a number of problems with the Prequel Trilogy films, be it the shift from wookies to ewoks in the final battle or to the straight up ridiculous moments that fail to appear anywhere else in the Original Trilogy until added later in the Special Editions. Why this happens is probably worth a book or a documentary, but it may simply boil down to the presence of children in his life and the loss of individuals willing to talk him down from certain decisions. Nonetheless, it’s this side of Lucas that ultimately brings about the silliest death of a secondary character in the Original Trilogy. We first find Fett at Jabba’s palace in the company of the fearful, the strange, and the sycophants of an organized crime lord’s entourage. The first significant moment occurs when Leia, in disguise as the bounty hunter Boushh, brings a manacled Chewbacca to Jabba. She threatens to blow up the room with a thermal detonator to get the price she demands for the wookie’s head and this instantly earns her credibility with Fett, who’s just hanging out (granted, he was also ready to blast a hole in her if needed). Fett remains a figure seen, but not heard, for almost the entirety of the film. His presence is difficult to parse, as he’s just there and not specifically engaged in any obvious activity other than being present. He’s also present on the sail barge that takes our heroes to the Sarlacc pit for their execution (where they will slowly be digested alive!). When all heck breaks loose, he’s the first to put his jet pack to use (the only one in the entire trilogy) and lands on the small skiff to try and stop Luke’s rescue plan. These few minutes represent the grand finale of his appearance in the movie. His moment of glory comes with an attempts to wrap Luke up in a cord. Enter the zany music played by Lucas in the background. Luke cuts the cord, which apparently had so much tension that it forces Fett to stumble forward. Then, as he recovers, he’s hit in the jetpack by accident with a staff wielded by a halfway blind Han. The impact of the staff ignites the pack (sounds like a safety issue! ), and Fett flies into the side of the sail barge, before plummeting into the Sarlacc pit to his presumed death. It’s a contemptuous death for a figure purposefully displayed as dangerous, resourceful, and successful in the previous film. In the Special Edition, Lucas adds a belch to the Sarlacc creature to add insult to injury. One could take that unnecessary embellishment either as Lucas wanting to troll Fett’s fans one step further or as the logical step to the silly humor he was already aiming to insert into Jedi. Why the character presented as the most dangerous bounty hunter among a line of bounty hunters, and as an equal to Darth Vader in Empire is reduced to a slapstick death in Jedi remains a mystery. Yet, the mystique of Fett likely was the reason that the bounty hunter didn’t remain dead, but was given a second life as a character who refused to stay part of a sand monster’s afternoon lunch. It was his mystique that initiated his fame prior to the movie, but his role in Empire is the main reason. It’s a role in which he was identified as the first among bounty hunter equals, the only character not a protagonist to talk back to Darth Vader, and to whom Vader treated as an equal. He saw through Han’s charade and set off the series of events that resulted in the heroes losing for the only time in the Original Trilogy. The expanded universe material that followed only added to his luster as a character not to be tangled with and whose very appearance sparked an obsession that continues to this day.